Often derided as the least of the fighters with which the USAAF went to war, the airplane the RAF rejected and only the Russians loved, the Bell P-39 "Airacobra" has mostly gotten a bad rap for events beyond its control, all stemming from the completely-idiotic decision by the Army Air Corps to remove the supercharger that originally equipped the prototype when it developed problems; this dropped the P-39's overall performance and crippled it at altitudes over 10,000 feet. When this was followed up by sending the airplane into combat with under-trained pilots in 1942 against the pilots of the Imperial Japanese Navy - at the time perhaps the best pilots in the world man for man - and forcing it to fight at altitudes at which it could not perform... well, no wonder it got a bad reputation. The P-39 prototype first flew April 6, 1939. It demonstrated a climb to 20,000 feet in five minutes, and a top speed approaching 400 m.p.h. which was admittedly achieved by an airplane lacking armor, weapons, ammo, and other operational equipment - after Bell’s advertising campaign about its speed, pilots were quite disappointed with the operational airplane they flew. The heavy armament of one 37mm cannon, two .50 cal. machine guns two .30 cal. 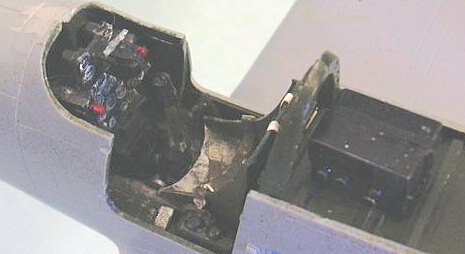 machine guns was made possible by the radical design step of mounting the Allison engine on the aircraft's center of gravity, behind the pilot, powering the propeller through an extension shaft. This also allowed the airplane to become the first fighter with a tricycle landing gear, which made it easier to handle on the ground than the conventional taildraggers. Unfortunately, the Army Air Corps at the time was singularly unimaginative in deciding on the use of the airplane. With an official national policy of isolationism in 1939, it was not expected that the United States would face an enemy with an effective fighter force; this meant that U.S. fighters would not need a high-altitude capability since they would be strafing invaders on the beaches. Thus, both the P-39 and P-40 were crippled at birth by the removal of the supercharging systems each prototype was originally equipped with. Only the P-38 escaped this fate since it was to be a bomber interceptor, and even the USAAC expected enemy bombers to come over at high altitude. The British Purchasing Commission ordered the airplane as the Airacobra I, based on the P-39D configuration which was the first version produced in any numbers for the Air Force. 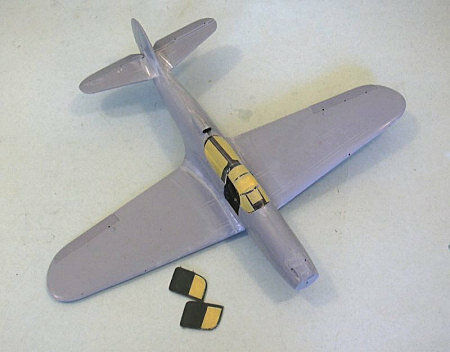 This airplane differed from the American version by the substitution of a Hispano 20mm cannon for the Oldsmobile 37mm weapon that equipped the P-39D. By the time the Airacobras arrived in England in July 1941, air combat was regularly taking place at altitudes well over 10,000 feet; 601 Squadron found the airplane lacking in capability for ETO conditions, and the 212 Airacobras already delivered under the RAF order were sent on to the Russians, who fell in love with them for their heavy armament and good handling. The remaining 179 aircraft on the British order were confiscated by the USAAF after Pearl Harbor and designated P-400 Airacobras, to distinguish them from the regular P-39s. In January, 1941, the 8th Pursuit Group became the first unit fully equipped with the new P-39 Airacobra. Throughout 1941, they put the airplane through its paces, finally taking it through the War Games in Louisiana, South Carolina and North Carolina during the summer and fall of 1941 that were effectively the “dress rehearsal” for war that revealed how unready the Army was. Following the entry of the U.S. into the Second World War that December, the 8th Pursuit Group was deployed along the East Coast to search for submarines and an alleged invasion force offshore. In January 1942, the unit was alerted for movement to the South Pacific, and the 80th Fighter Squadron departed San Francisco on January 10, 1942, to lead the way. The rest of the group sailed to Australia the S.S. “Maui,” an old cattle boat, at the end of January, arriving in Brisbane on March 6, 1942, to discover that the ship carrying their P-39's had been directed to Adelaide to unload. In late March 1942, reunited with their aircraft, the squadrons of the 8th FG moved to Townsville in Queensland, and in mid-April established themselves at Seven Mile Drome at Port Moresby, where they provided air cover for the Allied forces attempting to stem the advancing Japanese. While there for April and May, they endured food shortages, excessive heat, excessive rain, excessive mud, lack of necessary parts for their airplanes, in addition to continuous alerts against bombing and strafing attacks by the Japanese. On May 15, 1942, the designation Pursuit Group was changed to Fighter Group and the 8th Fighter Group was christened "Cyclone's Flying Circus" for their commander, Captain Emmett "Cyclone" Davis. Facing the highly experienced Japanese Navy pilots of the Tainan Air Group, based across the island from Port Moresby at Lae, the pilots soon learned how outclassed the P-39 was, with its inability to engage in combat above 10,000 feet, which meant they were always being jumped by the Japanese, which negated any chance there was to use the P-39's superior diving speed to make vertical attacks the way the AVG had learned to do over Rangoon. The fact that USAAF fighter pilots had never been given serious gunnery training also resulted in missed opportunities to hit the lightly-built Zero with the P-39's heavy cannon and 50 caliber machine guns. In August 1942, the Japanese invaded Milne Bay. That September, the 35th and 36th Fighter Squadrons replaced the RAAF’s 75 and 76 Squadrons at Milne Bay, with the 80th Squadron arriving on November 8. Following the taking of the Kokoda Trail and the defeat of the Japanese, the Group returned to Mareeba where the 80th Squadron was equipped with the P-38, which they took to Port Moresby in March 1943 to begin a record of outstanding achievement throughout the New Guinea campaign as the first of General Kenney’s P-38 units. As soon as he could get other, more capable fighters, General George Kenney took the P-39s off first-line air defense operations. The airplane had excellent performance at low altitude, and had made a name for itself in ground support for troops in the taking of Buna and as a tactical reconnaissance aircraft. Many of the pilots of the 8th, like their brothers in the 49th Fighter Group, would spread their early knowledge of air combat gained the hard way over New Guinea fighting superior opponents throughout the USAAF as they survived to rotate back to the United States and provide experienced cadres for the new fighter groups that would later rip the heart out of the Luftwaffe in Europe. One of these was Lieutenant Don “Fibber” McGee, who scored three victories in P-39s with the 36th FS, two more in P-38s with the 80th FS, and a fifth over Germany flying a P-51D in March 1945 as CO of 363rd FS of the famed 357th Fighter Group. The only other 1/32 kits of the P-39 I am aware of is an early vacuform that was (if I remember correctly) released by ID models and which was the kind of vacuform that gives the genre a bad name, and a resin kit that was the first release from Scratchbuilders; this kit is on my list of Ten Worst Kits Ever Released. Fortunately, this new kit from Special Hobby makes both of those nightmares obsolete. I have had the opportunity to see the built-up kit that was recently published over at HyperScale, and to compare it directly with the P-39N that lives out at Planes of Fame. The kit is an excellent recreation of the real thing. A couple of “experts” took issue with the kit when they saw the photograph, pointing to some “hip” in the rear fuselage behind the air intake, and questioning whether the fuselage was long enough. There is no “hip.” Not in the built-up kit, not in the kit residing in the box here at Le Chateau du Chat. If it ever “existed” it was some glitch in a digital picture. I have compared the fuselage, with the rudder and spinner, with published dimensions, and it is spot-on for length. The raised-panel surface detail is accurate when compared to the real thing. The cockpit is accurate when compared with the real thing, and the kit provides pre-painted photoetch seatbelts that add to the realistic finished look. The kit provides separate control surfaces that can be posed in more “dynamic” positions for a realistic final look. The kit is limited-run, which means one must test-fit three times before gluing once. If you keep that in mind, the model will present no real surprises. The biggest problem I found was that the seat was too short in height and the control stick too short. I scratchbuilt a better seat, modeling it on the “standard” seat from the Trumpeter P-47, using 10-mil sheet styrene, while I cut the control stick and replaced it with a length of .020 plastic rod from Evergreen. The other hard part of the project was assembling the nose gear, which is very “fiddly,” though it looks right when finished. This took a lot of test-fitting to get it right, because the instructions are not really that clear. Past that, everything fit all right, though I had to use cyanoacrylate glue to seal all the seams of the fuselage, the wing and the horizontal stabilizers. With these sanded down and the various panel lines re-scored, the kit came together. Special Hobby did a good thing when they made the upper nose panel separate from the fuselage. This means you can assemble the whole model and leave this off, fill the nose with sufficient weight to insure nose-sitting, then attach the nose panel, secure in the knowledge the model will sit right at the end. I also attached the landing gear after the model was painted but before the decals were applied. The cockpit, wheel wells, interior of gear doors and landing gear were painted with Xtracrylix “Medium Green,” which is a good color for the “Bell Green” used on the real thing. There is no real “Bell Green,” but the available evidence is that a color very close to Medium Green was used. I based this color choice on the restored P-39N at Yanks Air Museum, which is restored to “factory original condition” and is featured in the “P-39 in Detail and Scale” book. Yanks is impeccable in their work and their research, so I have no doubt of the accuracy of this restoration, despite the recent blithering of a certain “muddled dud” over at The Other Place to the effect that the wheel wells and landing gear were painted with Yellow Zinc Chromate, with the cockpit painted a standard Interior Green. After preshading the model, the lower surfaces were painted with Xtracrylix “Neutral Grey” and the upper surfaces with Xtracrylix “Olive Drab,” which was faded using Xtracrylix “Faded Olive Drab” mixed into the darker color in varying amounts to simulate tropical sun-fading. The kit decals do “Nip’s Nemesis II” flown by Lieutenant Don “Fibber” McGee were used without problem under a coat of Micro-Sol. These airplanes were “flown hard and hung up wet,” so I dinged it and applied exhaust stains, oil stains, and gun residue. After doing that, I gave the model a coat of Xtracrylix Flat Varnish, followed by a coat of thinned Tamiya “Flat Base” to make it totally sun-faded and flat. 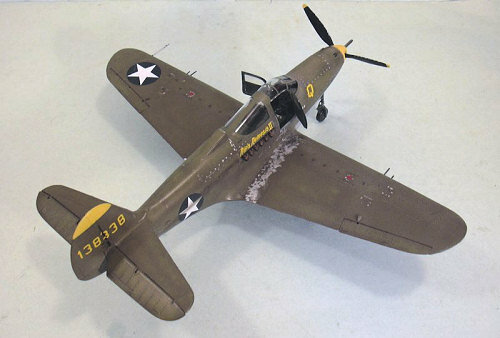 This new P-39 has excellent production design that leads to easy construction for a limited-run kit. The provision of resin exhausts - which are the only thing that visibly identify the various sub-types of P-39s - shows there will be future releases of different sub-types (with the Airacobra I/P-400 already announced). 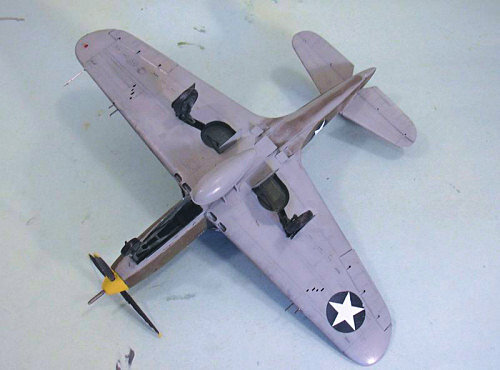 This is an excellent kit that catches the look of the P-39. Highly recommended. Thanks to MPM for the review kit.